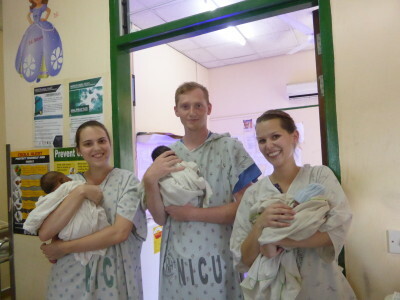 Our placements in Ghana are based at two large regional hospitals and a smaller district hospital. The regional hospitals are well suited to you if you are looking to specialise in a particular medical field. The district hospital is ideal for you if looking for an elective placement where you can help over-worked doctors in a busy out patient clinic. Our two biggest placements in Ghana are in two regional hospitals in Cape Coast. Both are teaching hospitals and take medical, nursing, physiotherapy and nursing students from the local university. The hospital is located near our accommodation and is close to the beach! We’ve chosen these hospitals because as regional hospitals, they are able to provide a broad range of departments for you to experience during your time with us. The hospitals are both relatively modern by Ghanaian standards and have between 100 and 250 beds. The hospitals acts as a referral centers for various regional health posts, district hospitals and local clinics in the Central Region. The conditions you are likely to see will therefore be varied and interesting. In additional to cases that have been referred to the hospitals, you will also get first hand treatment of more common illnesses in Ghana. Malaria will be by far the most common illness you will see, along with other tropical illness such as Typhoid and Hepatitis. As Ghana does not have the same levels of sanitation as us, you will also become experienced in the treatment of intestinal parasites and dysentery. Medical care in Ghana is not free, although a New Health Insurance Scheme recently introduced by the Government has started to place increased demands on the hospitals already limited resources. A lack of training and continuity exists in the medical system in Ghana. One of the hospitals has a brand new and well equipped operating theatre that sits dormant due to a lack of staff training in the new equipment. Ghanaian medics are very poorly paid and so it is not unusual to leave Ghana after 2-3 years training for better paid employment in Europe, the US or even other African countries. This puts enormous stress on the nursing staff. As a result the hospitals often have doctors on internships from overseas, most notably from Cuba! If your time with us permits, we will also arrange a programme of visits to rural health clinics or to the local community on outreach programmes. This could involve visiting a local orphanage on an inoculation programme and basic health check visit or going to a maternity clinic in a rural village with nurses from the regional hospital. A medical and nursing programme in Ghana really is a great opportunity to gain experience you couldn’t have hoped for at home. You will see medical conditions and their treatment that you probably would only have read about during your studies and are rarely likely to see in your career. Working hours are usually from 8 am to 2 pm Monday to Friday, but this will depend on the department that you have selected to work in. The smaller district hospital is was established in 1959 and is the only medical facility in the Gomoa district in Ghana’s central region. The hospital serves a district population of 225,295 within 187 separate communities. The hospital is a referring point for four health posts, five regional clinics a number of maternity homes and some other private clinics. During your stay with us you will have the opportunity to spend time at some of these clinics on a rural outreach programme. The hospital has various departments but most notably opportunities exist to experience OPD, theatre, Obstetrics & Gynaecology and A & E. The hospital also operates a regional HIV and STI clinic. The busiest department is OPD where it is not uncommon for the two doctors to see up to 400 patients a day! The hospital sits close to the major Accra to Cape Coast trunk road which is a noted accident black spot and as such, the hospital often receives victims of nearby road traffic accidents despite the fact that the A & E department is relatively small. The hospital also doesn’t yet have an ambulance so many accident victims injuries are exacerbated by journeys to hospital in the back of pick-up trucks. Medical care in Ghana is not free and the hospital is no exception. However, as a Catholic Hospital the patient’s ability to pay doesn’t always restrict the availability of treatment but it does put a strain on the hospitals limited resources.